The Shannon-Hartley Theorem represents a brilliant breakthrough in the way communication theory was viewed in the 1940s and describes the maximum amount of error-free digital data that can be transmitted over a communications channel with a specified bandwidth in the presence of noise. As you can see, and as threatened in Blog 1: Categories of LPWA Modulation Schemes, we’re going back to basics and generating the framework and vocabulary to justify and discuss the categories of Low-Power, Wide-Area (LPWA) connectivity: Ultra-Narrow Band (UNB), Non-Coherent M-ary Modulation (NC-MM), Orthogonal Division Multiple Access (OFDM), and Direct Sequence Spread Spectrum (DSSS). Before jumping directly into the details of the Shannon-Hartley Theorem, lets set the stage with the concepts of receiver sensitivity, Eb/No, and spectral efficiency (η). Receiver sensitivity is the amount of energy required for demodulation. A link with better receiver sensitivity will have longer range and more robustness, which will equate to less density of infrastructure. The number -174 dBm is based on Boltzman’s constant and represents the thermal energy at room temperature per Hz. NF is Noise Figure, which is a figure of merit that is typically around 2 to 5 dB for a given radio front end. There is an inverse linear relationship between receiver sensitivity and data rate. The better the Eb/No, the better the receiver sensitivity at a given data rate. Spectral efficiency is the amount of data that can be transmitted in a single link per Hz of bandwidth. So why is spectral efficiency important? It’s because spectrum is typically a fixed and valuable asset. For a multiple access system to operate well, it’s often important to channelize so that multiple communications may occur simultaneously. The formula for the amount of data throughput that can be moved through a piece of spectrum is η x BW. BW is typically fixed – if it’s free spectrum, there is a very finite amount of it, if it’s licensed spectrum, then it’s extremely expensive. The role of a good modulation scheme is then to make sure that η is as high as reasonably can be designed. The Shannon-Hartley theorem describes the theoretical best that can be done based on the amount of bandwidth efficiency: the more bandwidth used, the better the Eb/No that may be achieved for error-free demodulation. Or, equivalently stated: the more bandwidth efficient, there is a sacrifice in Eb/No. The Shannon-Hartley theorem applies only to a single radio link. It does not directly apply to a multiple access system that is important in a Wide-Area Network (WAN). Nevertheless, Shannon-Hartley is a great starting point. where η is spectral efficiency measured in units of bits/Hz. This relationship is shown in the figure below. Note that what’s called the Shannon Limit (which is -1.6 dB) is asymptotically approached when η = 10-1. As spectrum efficiency is increased, the required Eb/No increases. Stated another way, as η increases, not only is there more power required (or worse receiver sensitivity) because you’re moving more bits, but each bit actually gets more expensive in terms of power required. That’s a double whammy in terms of receiver sensitivity. Say you want to cover as much distance with your link as possible. Shannon-Hartley tells you that you can reduce data rate to get better range (in theory without limit). At this limit, it costs a fixed amount of power to get a bit through – so every dB of data rate reduction buys you 1 dB of receive sensitivity. But, the more you do this, the less the capacity. You’ll be getting a trickle of data through this admirable amount of spectrum you happen to have access to. Okay fine, you say. Then let me just get a lot of data through my spectrum (that’s a perspective that is important in the cellular industry). If it’s a fixed amount of power per bit, then I’ll crank up the power and get a factor of 10 data rate increase for every factor of 10 dB increase in transmit power. But, not so fast, says Shannon-Hartley. If you look at the curve, the amount of power per bit increases dramatically as η becomes larger than 1. Not only are you spending power getting more bits through your spectrum, each bit is getting considerably more expensive. Nevertheless, in the 3GPP standards body, the quest for ever-increasing data rates has caused pushing up this curve as much as possible. As an example, 256 Quadrature Amplitude Modulation (QAM) that has a spectral efficiency of close to 9 (η=9 which is pretty much the far right point in the figure above) is being currently standardized. Oh, and just to add insult to injury – Shannon-Hartley is the best-case scenario. It’s what could be achieved with infinite computation power, infinite latency (because the coding blocks become infinitely large), infinite frequency accuracy, etc. Everything in the real world will be worse, perhaps even much worse. What do smart people do when confronted with such bad news? How about look for a loophole! We definitely need such a loophole to build a high coverage, yet high capacity network (a trickle won’t do). Something called “spreading” may be that loophole. 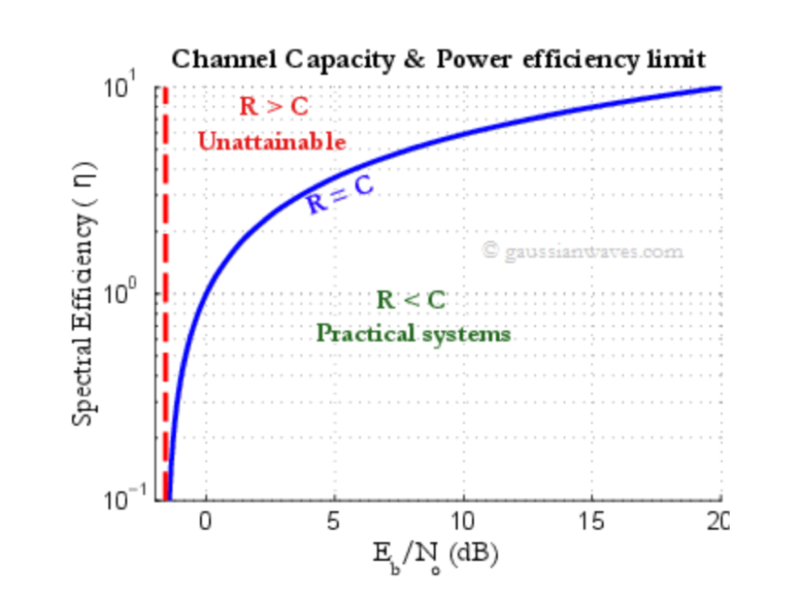 “Spreading” is maintaining the channel bandwidth (BW) regardless of data rate and allowing very low link spectral efficiencies (η <<0.1) to achieve high receiver sensitivity. On the face of Shannon-Hartley, this seems like an exceedingly bad idea. Yeah, you may get the coverage you need, but you only get a “trickle” of small amounts of data through that precious spectrum. That’s okay, a lot of loopholes seems like a bad idea at first and we will explore the implications of this approach in Blog 4: “Spreading” – A Shannon-Hartley Loophole? But first, because there are multiple ways to “spread” a signal, we need to first understand how LoRa/Chirp Spread Spectrum (CSS) can be analyzed and we lay that framework in Blog 3: Chirp Spread Spectrum (CSS): The Jell-O of Non-Coherent M-ary Modulation. And finally, we’ll get back into the real world and test whether this discussion is even useful in in Blog 5: The Economics of Receiver Sensitivity and Spectral Efficiency to attempt to quantify the commercial value of that which is discussed on these blogs. At any point, if you’re interested in a more in-depth treatment of these topics, please download, How RPMA Works: The Making of RPMA.